Andrea is a Biochemistry major at SUNY Cortland, and she is investigating the microbiome of hops flowers. Andrea's Summer 2018 research is funded by a fellowship from the SUNY Cortland Undergraduate Research Council. Kristen graduated with a BS in Biochemistry from SUNY Cortland in May 2018. She performed proteomics to mine for functional diversity in anaerobic bioreactors. Her summer 2016 research was supported by NSF grant 1336186. Kristen gave poster presentations on her research at the 2017 NEMPET Conference and at the 2017 Transformations Day here on campus. Michelle graduated with a BS in Biochemistry from SUNY Cortland in December, 2015. Michelle is now a graduate student in at the University of California - Riverside. Michelle's summer 2015 research, supported by a fellowship from the SUNY Cortland Undergraduate Research Council, was on optimizing metaproteomics methods for analyzing enzyme expression in anaerobic microbial communities. Michelle presented a poster on her undergraduate research at the 2015 NEMPET conference. Dylan graduated with a BS in Chemistry from SUNY Cortland in May 2016. In Fall 2016, Dylan started graduate study in Environmental Engineering at John Hopkins University. Dylan worked in our lab for two summers: 2014 summer research was supported by a fellowship from the SUNY Cortland Undergraduate Research Council, and his summer 2015 research, in collaboration with the Angenent Lab at Cornell University, optimizing our hexanoic-acid-producing bioreactor, was supported by NSF grant 1336186. Dylan has presented posters on his undergraduate research results at the 2014 and 2015 NEMPET conferences as well as at the 2015 and 2016 Transformations Days here on campus. Katie graduated from SUNY Cortland with honors in May 2015 with a BS in Chemistry and minors in Mathematics and Criminal Justice, and she is now working in industry. In our lab, she worked on LS-MS proteomics research for two years. Katie's 2014 summer research was funded by National Science Foundation grant 1336186 and her 2013 summer research was supported by a fellowship from the SUNY Cortland Undergraduate Research Council. In the photo, Katie is using our new UPLC-MS/MS instrument (NSF grant 1337695), developing a method for performing shotgun proteomics. Katie has presented posters her research results at the 2014 NEMPET conference as well as the 2014 and 2015 Transformations Days here on campus. Joe graduated from SUNY Cortland in 2014 with a BS in Chemistry and is now working in industry. In our lab, Joe investigated the effects of solution conditions on extraction efficiency of hexanoic acid from a bioreactor system. His Summer 2013 research was supported by a fellowship from the SUNY Cortland Undergraduate Research Council. Joe presented a poster on his research at the 2014 Transformations Day here on campus. In the photo, Joe is analyzing a sample on the Chemistry Department's gas chromatograph / mass spectrometer (GC/MS) instrument. Adam graduated with a BS in Chemistry, and is now teaching high school chemistry. Adam worked in our lab for two years, 2012-2014, and when performing his research he has often been seen as depicted on the right: PERL coding and puzzling over a coffee! Adam's research over Summer 2013 was supported by a fellowship from the SUNY Cortland Undergraduate Research Council, and his 2012 summer research was supported by a fellowship from the Binghamton University/SUNY Cortland Chemistry Collaborative. Adam gave a research talk in 2013 and presented a poster in 2014 at Transformations Day on campus. John graduated from SUNY Cortland with a BS in Biochemistry in 2014. He is now a graduate student in the Biochemistry and Molecular Biology PhD program at Michigan State University, where I'm sure he will be doing all kinds of exciting stuff! He was one of the first students in my lab, and worked on his research project from 2012-2014, investigating the response of benthic microbial communities to perturbations with toxic compounds. In the photograph, John is preparing to gather sediment samples for his research, from on-board the Cayuga Lake Floating Classroom's MV Haendel. 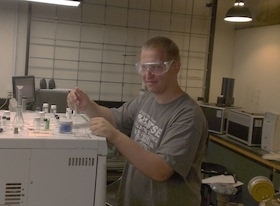 John's 2012 summer research was supported by a fellowship from the SUNY Cortland Undergraduate Research Council. John presented posters on his undergraduate research at the 2013 and 2014 Transformation Days on Cortland campus, and he presented his work to legislators and other SUNY researchers at an April 1, 2014 conference in Albany, NY: The Innovative Exploration Forum: Undergraduate Research in New York State's Public Higher Education System. Jeremy graduated from SUNY Cortland in 2013 with a major in Biology and a concentration in Environmental Science. Jeremy worked in the lab (May 2012-Jan 2013) on assembling metagenomic sequencing reads and analyzing the resultant metagenomics data. His research was funded by a 2012 summer research fellowship from the SUNY Cortland Undergraduate Research Council. Jeremy gave a talk on his research at the 2013 Transformations Day on Cortland campus. He's now moved on to other big and exciting things. Last I checked he was doing graduate research in Aquatic Ecology at SUNY Brockport. Best of luck Jeremy!